Agnigarh is a hillock located in Tezpur, Assam, India. In Hindu mythology, it is the site of the fortress which was built by Banasura to keep his daughter Usha in isolation. The name itself is derived from the words ‘Agni’ (meaning fire) and ‘garh’ (meaning fortress or wall) in Sanskrit. Present day Agnigarh is a hill on the banks of the Brahmaputra which is one of the big tourist attractions in Tezpur. 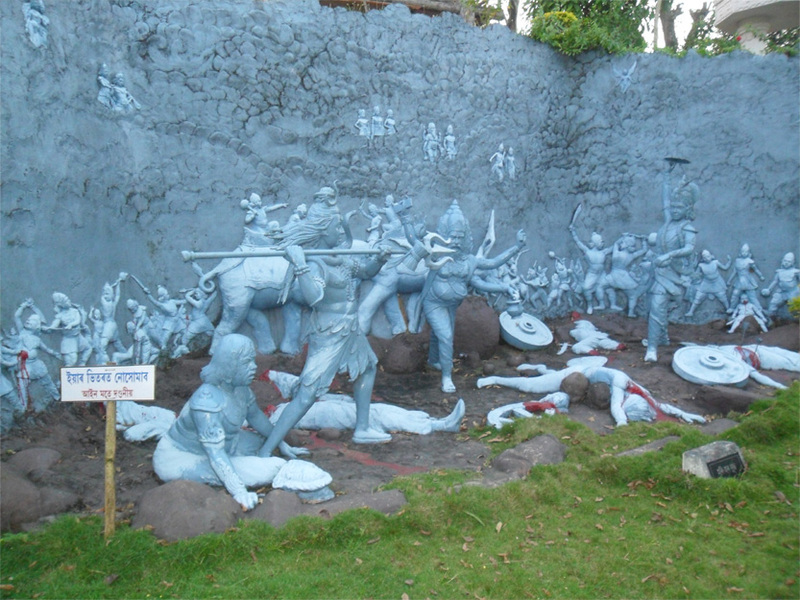 There is a circular stairway leading up to the crest of the hill where there are now sculptures depicting Usha’s abduction of Aniruddha, the grandson of Krishna and the ensuing battle by Krishna to free them. There is a tall viewing platform from where the entire Tezpur town can be seen. We can also see the Kalia- Bhumura bridge which shines like a beautiful necklace over the vast Brahmaputra river.